As winter approaches it is time to check the antennas. Once ice and snow arrives it is often too late. So I recently spent a couple of hours checking over my Diamond 5-band vertical. It coincided with a DX contest so I would be able to chek the results of my work. Almost all antenna problems are external mechanical faults and are visible. From a wisp of thin wire causing a short to serious corrosion – they can all cause equal problems. Much head scratching can result, but believe me it is easier to solve in warmer weather! I always wrap joints in self amalgamating tape. It keeps moisture out and dramatically reduces joint corrosion. It also makes it much easier to take sections apart and re-tune if necessary. Also, check the feeder cable connexion. This is a major soure of reported problems and one of the most overlooked. Tuning and operation can be checked with a simple VSWR meter, but I prefer an antenna analyser. The latest ones have graphic displays and are particularly handy for checking resonance on multi-band antennas. My checked payed off as water had got into the coax feeder and caused corrosion. I cut the feeder back about twelve inches and made a new connection. Everything else seemed OK. I made myself a coffee and switched the rig on to make sure everything worked OK. It did, and in the process I gave a few points away in the DX contest. But don’t expect to see my call in the results! We now have some of the fine InnovAntennas on display at Hockley. 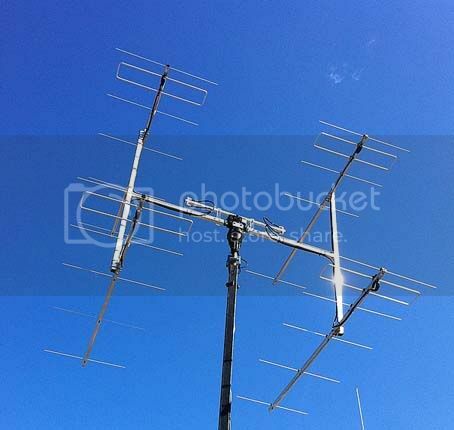 These include a 10m 3 element beam, 3 element 6m beamd and a 4 element 2m Yagi. Word is travelling fast that these antennas outperform anything else that has previously been available, both in gain and low noise performance. The construction and engineering is second to noe and even the Americans are now switching from their home grown antennas to the superb InnovAntenna range. If you want to experience a new standard and performance that really works the DX, whether it be HF VHF or EME, then give us a call. The new ARL2300 ETHERNET CONTROLLER and associated software, allows remote monitoring using the AR2300/AR5001D receivers. This permits control and audio feed to be channelled over the internet and thus permits the remote monitoring and control of AOR receivers anywhere in the world, using simple to install AOR software. We will shortly be launching several EME IN A BOX starter antenna kits from InnovAntennas. 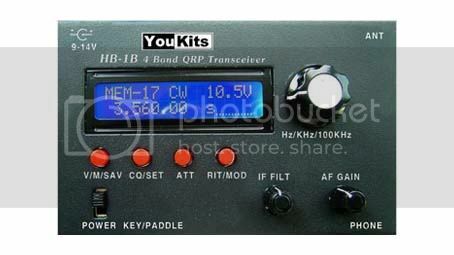 These will enable newcomers to enjoy moon-bounce QSOs. The picture shows a 2m antenna system that can easily be installed in most locations and will enable users to bounce signals of the moon and enjoy world wide contacts. Systems will be available with Yaesu G5500 rotator and will include phasing harnesses and the mounting frame for the antennas. The antennas are specially made by InnovAntennas to combine maximum gain with best noise performance. We must stress that many normal antennas do not offer the gain and noise performance achieved by InnovAntennas. And of course you can use their systems for terrestrial contacts to equal advantage! Please contact us for availability. Local Aerial Specialist Glen Burns of StarView Aerials has now passed his Amateur Radio Foundation Licence, and has been awarded the callsign M6GTV. 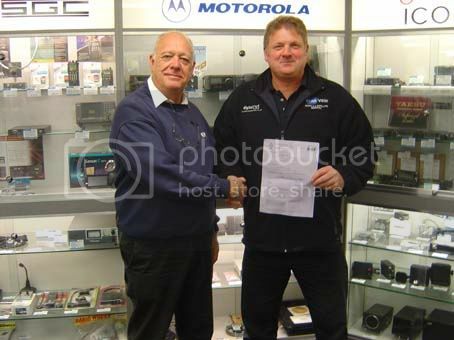 He is pictured below (right) being congratulated by Roy Britt our PMR Account Manager (left). Glen provides an excellent professional service and can install any antenna you require including amateur aerials, find out more at his website. Swimmer Jo-Jo Cranfield won the ‘Disability Sports Personality of the Year’ for the second year in a row. 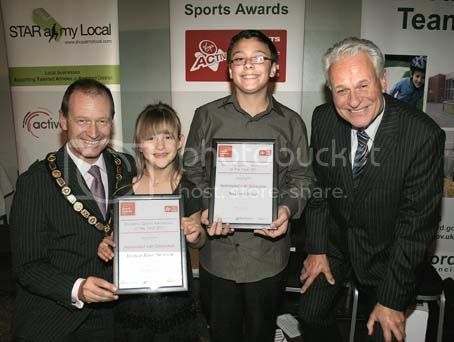 At the DSE Short Course Junior Nationals 2010 held in Sheffield in February she won Silver medals in 100m Freestyle, 200m Medley, 400m Team Medley & 100m Breaststroke. She also passed her A-Levels and earned a place at the prestigious Loughborough University studying for a degree in Sports Coaching, she has also been offered a place in the Elite Loughborough University Swimming Team alongside World Championship swimmers such as Liam Tancock and Joanne Jackson. 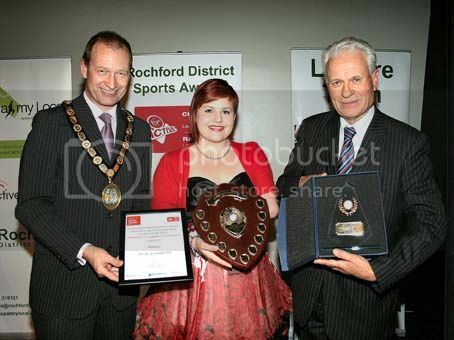 W&S would like to wish Jo-Jo the best in her campaign to compete in the 2012 Paralympic Games and congratulate her on her win at the Rochford Award Ceremony, you can find out more about Jo-Jo at her website. Waters & Stanton would also like to congratulate Nathan Benee & Jessica Rose Newson who were nominated with distinction for the award. Nathan is a talented footballer from Sweyne Park School who has represented Tottenham Hotspur & England. Jessica-Rose is an equestrian who competes in regional dressage competitions and won the RDA U16 Dressage contest aged just 5. They are pictured below with Simon Smith & Jeff Stanton. Our Service Administrator, James Payne has completed his course of instruction with Chelmsford Amateur Radio Society to attain his Foundation Licence. 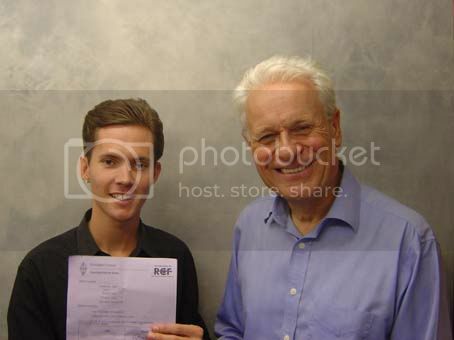 He is now eagerly awaiting his Licence so that he can get on air! He is photographed being congratulated by Jeff Stanton. Update: James has been given the callsign M6JTP. 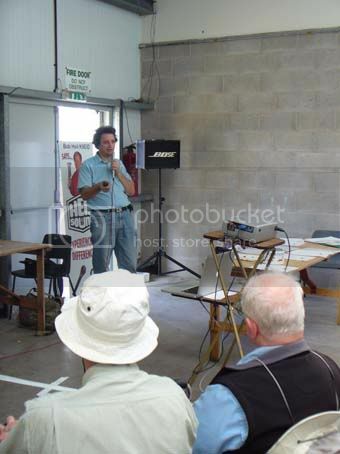 The 2011 National Hamfest held on Friday 31st September and Saturday 1st October was a great success again for all. W&S had alot of fun and met old friends and new, the highlight (besides the fantastic weather!) 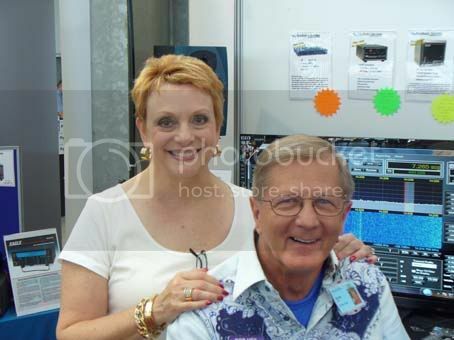 this year was having Bob & Sarah Heil on our stand. If you missed out on the fun this year make sure you get along to the Newark & Nottinghamshire Showground on 28-29th September 2012! Sarah and Bob Heil, K9EID on the W&S stand at recent Newark Hamfest. 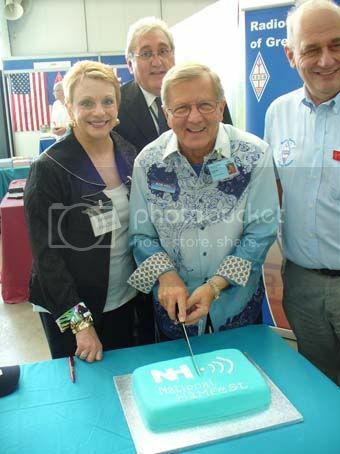 RSGB President Dave Wilson, M0OBW and Sarah Heil look on as Bob Heil cuts the cake at the opening of Newark National Hamfest. 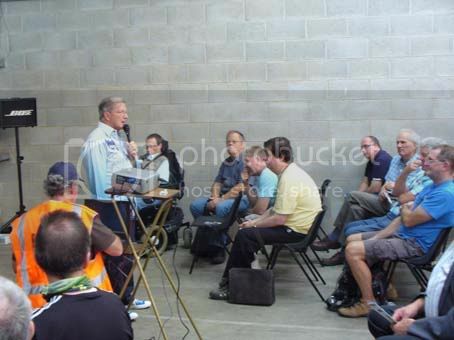 Peter Waters, G3OJV lectured on HF antennas at the Hamfest. 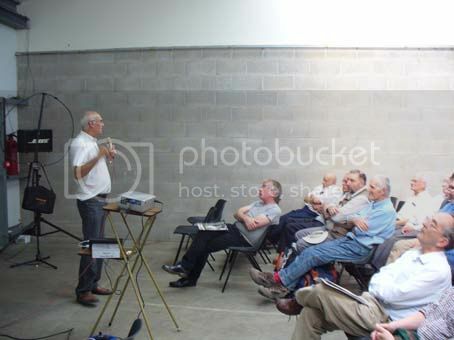 Jonathan, G0DVJ lectured on learning Morse Code before the Essex CW Club held their AGM. Bob Heil, K9EID gave very interesting presentations on microphone technology on both days to very attentive audiences. We feel we must respond to the above as it directly affects our Company. For background, please read earlier blogs in March and September 2011. The matter continues. The Acting General Manager, recently released a statement about the RSGB’s Convention situation. Copies available by mailing gm.dept￼rsgb.org.uk. This document provides the strongest evidence yet of how the Society favours one chosen dealer. Sadly it also conveniently misses out some key facts. What was not mentioned was that the Society had for years very effectively locked out all other dealers by means of a trumped up claim that there was a long term written sponsorship contract in force until 2012. Who fabricated this story and and why? The Society will not tell us. The statement also failed to mention the major argument that took place at the Convention last year with their sponsor and how the RSGB ended up backing down. and letting more trade stands in. The current agreement that Don’s document refers to is a hurried arrangement made in March and signed by both parties – by coincidence, the same time we reapplied to attend the Convention. Also the time when the RSGB realised that we had uncovered the false claims they had made over all those years. It took until July for Don Beattie to finally agree to meet with us together with the President. In August Don sent an email saying “we do feel that we can make available one table area (about 2m linear). This would be available for display purposes only, on the same basis as Yaesu, Icom and Kenwood” Nobody can be in any doubt as to what that meant. But then it appears the Society were pressured to retract that offer. By who and for what reason? The Society will not tell us. And why after Don’s email to us saying we could go, were we asked in a subsequent email to keep quiet about it? In September, we are told by Don Beattie that we could not after all attend, even to display goods for companies that we are the UK distributors for. He then proceeded to give a very muddled explanation that if the manufacturers were to send their own representatives from the USA, that would be OK. But W&S, as the appointed distributor could not attend. Yes he really said that! We have asked for a copy of the written agreement to check the wording, as it appears that the Society may have signed an agreement that specifically sets out to block certain companies within the UK. Alternatively, the agreement is being interpreted in a rather creative way! The Society have refused to release the wording. That only serves to heighten the suspicion of what actually is going on behind the closed doors of a Society that is claiming to be working towards openness. And don’t be taken in by the fact that the current sponsor has contributed a lot of money and therefore needs to be treated “as an exception” (the RSGB’s words). Firstly it is done for the reward that the trade brings in. Secondly, if Don wants to discuss donations, perhaps he has forgotten the donations we have made in the past for NO return? This year there were four trade stands plus one vacant position that was to be ours. It would be interesting to see what the membership think of the way this has been managed by the Society. For our part we will continue to strive for fairness and openness and above all a level playing field. This after all is a hobby industry populated by hard working small companies, not major corporations. You are currently browsing the Waters & Stanton Blog blog archives for October, 2011.